This work is a pendant to Landscape with a Wayside Tavern (RCIN 403531). Both pictures are conscious pastiches of Dutch seventeenth-century paintings. The present painting is more of a capriccio than Landscape with a Wayside Tavern, with a ruined Classical temple in front of which a shepherd tends his flock and an elderly man reclining on the ground gestures to a woman and her children. 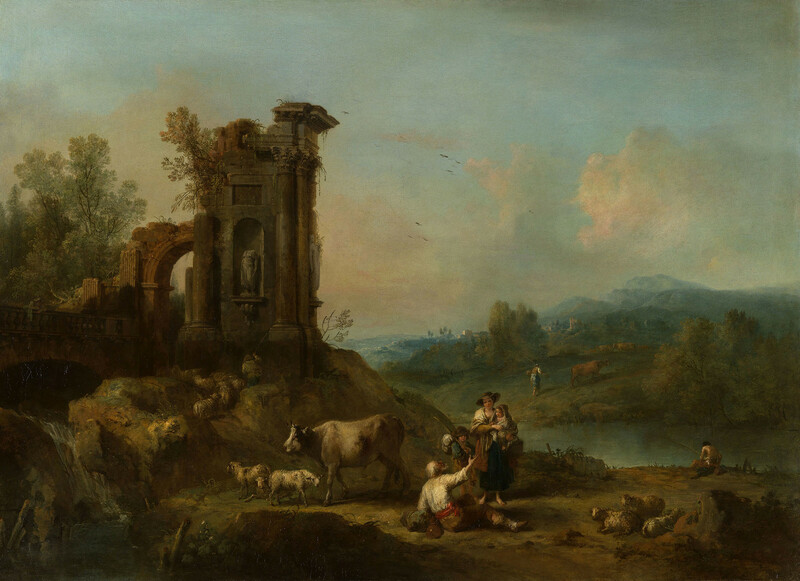 The paintings of Nicolaes Berchem with shepherds and herdsmen in warmly lit southern landsapes was the main source for Landscape with Classical Ruins, Cattle and Figures. The woman holding her baby is similar to the subject in Zuccarelli’s earlier Shepherdess (Albertini Collection, Rome) of 1735–40. The ruin covered in foliage, its grey marble contrasting with the red stone of the arch, is derived from Marco Ricci, as is the attention given to the fall of light. The sun, at a low point on the left, throws the bridge and waterfall in the left foreground into shadow. As with Marco’s paintings, the eye is guided to the distant horizon by features picked out by the sun, such as the distant tower and the tops of trees; however,the warm, atmospheric, luminous haze filled with a scattering of light is Zuccarelli’s own. Furthermore, his modelling is more energetic than Ricci’s, the loose touches of paint for the wool of the sheep recalling the free brushwork of Alessandro Magnasco. Typical of Zuccarelli’s technique in both paintings are the final touches to the landscapes. For example, the bent grasses on the ruin and the reeds in the foreground here are dry and stiff, the paint having been pulled over the layers beneath.